Perhaps you’ve heard of carbon dioxide before, but probably not in any positive terms. Carbon dioxide emissions are painted as the major culprit behind global warming. And the levels of carbon dioxide, also called greenhouse gas, in the atmosphere have indeed increased, from 0.025% in 1750 when industrialization began, to today’s level of 0.04%, which is a very big increase of 60% in a relatively short period of time. The increasing amount of carbon dioxide in the atmosphere means that more infrared heat from the sun is reflected back to earth and stays here, instead of returning into space. This article however, is about the levels of carbon dioxide in the body, but here too, carbon dioxide has a bad reputation. Generally, oxygen is considered to be the amazing life-giving substance, while carbon dioxide is just a toxic waste product that we want to get out of the body as soon as possible. However, nothing could be further from the truth. A normal breathing at rest is about 6-12 breaths per minute and about half a liter of air per breath, giving a total breathing volume of about 3-6 liters of air per minute. But many of us breathe a lot more, often 18-25 breaths per minute and up to one liter of air per breath, giving a breathing volume of up to 10-15 liters per minute. This over-breathing implies a low-grade form of hyperventilation, which leads to imbalance between oxygen and carbon dioxide – we get too much oxygen in the body while at the same time remove too much carbon dioxide through exhalation. At a breathing volume of six liters per minute, we only use about twenty five percent of the oxygen we inhale. Therefore we exhale the remaining seventy five percent. At the same time, the amount of carbon dioxide we exhale is about a hundred times higher than the amount we inhale. The oxygen travels around the blood bound to hemoglobin. At a normal breathing volume at rest, hemoglobin is already saturated with almost as much oxygen as it can, 96-99 percent. The oxygen saturation of hemoglobin is easily measured with a pulse oximeter attached to the finger or the ear. Over 95 percent is considered normal. When we already have such high oxygen saturation, and furthermore only use a quarter of the oxygen we breathe in, there is no purpose of breathing the 10-15 liters per minute that many of us do. Instead this over breathing, 2-3 times more than normal, gives an opposing effect, which imposes a heavy load on our body, much like eating 2-3 times more than normal. Just as little as a car work better because it gets more fuel, nor does our body work better because we take more breaths and inhale more oxygen. It’s all about balance. Our car stops both if it gets too much or too little fuel. It needs the right amount, adapted to the needs there and then, as it differs greatly depending on whether you drive on the highway at 110 km/h or at 30 km/h in a residential area. The same applies to our breathing. If we stop breathing, we die because of oxygen deficiency. But when we breathe too much, as many of us do, we get too much oxygen in the body and too little carbon dioxide. As oxygen is a very reactive gas, excess leads to an increased amount of free oxygen radicals, also known as oxidative stress. The reaction is the same as when metal rusts, or when the apple’s pulp becomes brown when exposed to light and oxygen. When the free radicals, the oxidation, form in the body, the number of inflammations increases. If oxidation is taking place at a higher rate than the body can handle, the aging process is accelerated. But impaired breathing isn’t just about an excess of oxygen and more inflammations. An even more far-reaching negative effect is the lack of carbon dioxide that occurs. We all know about blood pressure. It is measured in mmHg (millimeters of mercury) and a normal blood pressure is considered to be 110-130/80. However, carbon dioxide pressure is not as well known, mainly because it’s difficult to measure and probably also because there has been a lack of interest and knowledge about breathing within the healthcare system. An optimal carbon dioxide pressure is between 40 and 45 mmHg, and is crucial for our wellbeing. The carbon dioxide pressure varies with each breath and therefore provides a much better view of our current health status – mentally, emotionally and physically, as compared to measuring the blood pressure. Carbon dioxide is constantly produced in the cells of our body, about one liter in four minutes at rest, and when we breathe, we exhale the carbon dioxide that has been built up in the body. The more active we are, the more carbon dioxide is produced. That’s why we breathe more if we’re out running compared to sitting on the couch and relaxing. 1. Controls breathing. The carbon dioxide pressure controls our breathing, via pH. The brain stem, located between the spinal cord and the brain, controls our body’s basic survival functions: hunger, thirst, breathing, heartbeat, blood pressure, fears, aggressions, flight behaviors and reproduction. Our cells constantly produce carbon dioxide and when the levels in the blood increase, the pH goes in the other direction and decreases, which stimulates the respiratory center in the brain stem, and we inhale. At the subsequent exhalation, large quantities of carbon dioxide follows the exhaled air. 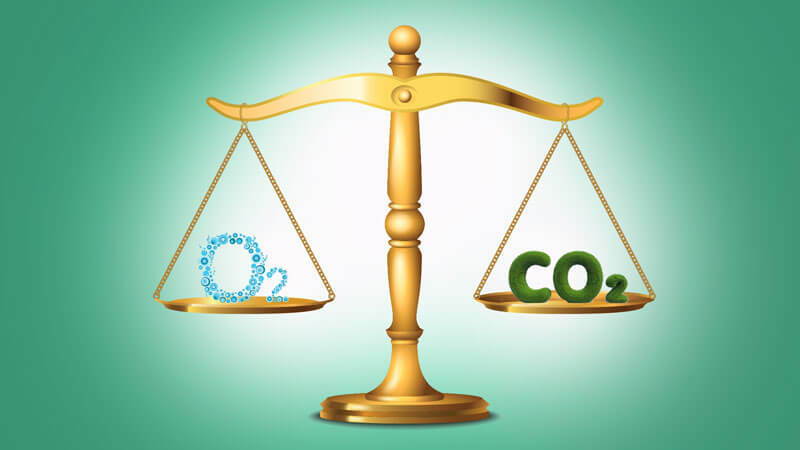 The carbon dioxide levels are then lowered, while the pH is raised, and when the level of carbon dioxide again rises high enough and the pH is lowered enough, a new inhalation is triggered. A lower carbon dioxide pressure makes us breathe faster, and over time, more shallowly. 2. Regulates pH. From school, you may remember the pH scale and that substances with a pH below 7 are acidic and over 7 are alkaline. In our body we have over 100,000 different proteins, each designed to execute various tasks like fighting a bacteria, moving a muscle or digesting the food we eat. In order for the proteins to function optimally, the right pH balance, i.e. the right environment, is absolutely crucial. Our main pH regulator is our breathing, as we regulate our body’s pH with each breath. When our breathing habits are impaired, we exhale too much carbon dioxide, which causes the pH to rise and we thereby change the environment in our body, so that the proteins can’t function as intended. There is a close link between the over breathing that increases the pH, and cravings for food and drink that lowers the pH – for example fast food, fast carbs, candy, soda, ice cream and cookies. They feed each other and the risk is that we end up in a vicious circle that is difficult to get out of. 3. Antibacterial. Carbon dioxide has an antibacterial effect. A study at the Karolinska Institute in Sweden showed that the growth of staphylococci was 1,000 times higher when the bacteria were exposed to normal air (37 degrees) for 24 hours compared to exposure to 100 percent carbon dioxide. Since the 1930s, carbon dioxide is used for food packaging. Bread, cheese, chicken and coffee are examples of products packed in 100 percent carbon dioxide. The antibacterial effect of carbon dioxide prevents the growth of germ-causing bacteria. 4. Increase oxygenation. Carbon dioxide force the oxygen away from the blood so that it can enter into our muscles and organs, and be of use. This is called the Bohr effect after the discoverer, the Danish Christian Bohr. A simplified example of the Bohr effect are fire extinguishers containing carbon dioxide. A fire needs a material to burn in as well as oxygen. One way to put out a fire is by spray carbon dioxide on it, which forces the oxygen away and the fire dies out. This is similar to what happens in our body when for example carbon dioxide leaves a working muscle. When the carbon dioxide reaches the blood, to be transported to the lungs for exhalation, the carbon dioxide kicks out the oxygen from the blood, which takes the opposite direction and goes into the muscle, oxygenating it so it can continue to work. 5. Widens the blood vessels. An optimum carbon dioxide pressure keeps the blood vessels open, as carbon dioxide has a relaxing and widening effect on the smooth muscle surrounding the blood vessels. As an adult has about 100.000 km (60.000 miles) of blood vessels, i.e. 2½ turns around the globe, it’s easy to understand that a lack of carbon dioxide impairs circulation and, for example, causes cold hands and feet. As the blood vessels become more constricted, the heart naturally has to work harder in order to pump the blood, which can lead to high (fight/flight-phase) or low (freeze/exhaustion-phase) blood pressure. 6. Widens the airways. Carbon dioxide widens the airways in the lungs, throat and nose. The respiratory tract can be likened to a snorkel, where the air travels in increasingly smaller passages until it finally reach our lung sacks, the alveoli, where the gas exchange occurs. It’s crucial that the airways are open, as it requires 16 times more effort to move the air in and out of the lungs, for each reduction of airway diameter by 50%. Narrow airways and nostrils and a stuffy nose is logical as it’s the body’s defense mechanism to try to maintain an optimum carbon dioxide pressure. Carbon dioxide is produced in the body and basically all carbon dioxide leaves the body via exhalation. In case of deficiency, the body tries to reduce the outflow by narrowing the airways. 7. Calms down the brain. In case of panic attacks and fear of flying it is common to get a bag to breathe in and out through, so that a part of the exhaled air is re-inhaled. Exhaled air contains a lot of carbon dioxide and naturally, when we re-breathe some of this air, the carbon dioxide levels in the body are raised and the person with panic attacks or fear of flying calms down. In one study, twelve healthy medical students hyperventilated. At one time, they breathed normal air, and on the other occasion, the air contained five percent carbon dioxide, i.e. 100 times more than normal. The stress hormone adrenaline increased by 360 percent as they breathed normal air. During hyperventilation with carbon-enriched air, the adrenaline levels were unchanged. Low carbon dioxide levels thus lead to a strong stress response and an adrenaline rush. People diagnosed with COPD (chronic obstructive pulmonary disease) and lung emphysema have damaged lung tissue. It makes it difficult for the carbon dioxide to be transferred from the blood to the exhaled air. Therefore, these individuals have high levels of carbon dioxide despite poor health. The breathing retraining, however, works excellent for them as well. When they improve their breathing, for example by using the Relaxator, the pressure increases in the lungs so that the excess carbon dioxide can escape via the exhaled air and the levels are restored to normal. The exercises Hold your breath while sitting and Hold your breath while standing gives you an idea of your ability to tolerate carbon dioxide and how low or high levels of carbon dioxide you have in your body. Low levels of carbon dioxide, or a low level of tolerance, means that we need to breathe often and heavily. An important purpose of The 7 Step CBR Program is to teach our body to tolerate higher levels of carbon dioxide, which leads to a calmer breathing where we take fewer breaths per minute. This article is based on the book The Power of Your Breath.